I was recently reminded that it’s been ten years since the WDC’s conference ‘Delivering Balanced Regional Development’ in May 2008. The context at that time was that balanced regional development had been included as a key objective of the National Development Plan 2007-2013 and was to have been a key consideration in public investment decisions. At the same time however, the economic crisis was beginning to unfold. The WDC therefore felt it was timely to provide a forum in which the policy issues involved in balanced regional development could be discussed and debated. Held at the Hodson Bay Hotel in Athlone, speakers included academics and researchers Professor Neil Ward from the Centre for Urban and Rural Development Studies at Newcastle University, Professors Gerry Boyle (NUI Maynooth) and Michael Keane (NUI Galway), as well Dr. Edgar Morgenroth (ESRI). The line-up also included a number of policymakers including Julie O’Neill, Secretary General of the Department of Transport, Mark Griffin (Department of Planning) and Dermot O’ Doherty (InterTradeIreland). All the presentations can be downloaded from here. The focus of this post however is the paper by the WDC Policy Analysis team, presented by Dr Patricia O’Hara, then Policy Manager of the WDC. Looking back at the paper I’m struck by how much has changed and how much has stayed the same. The past ten years have seen massive changes in the country – the recession and recovery, a return to emigration, Brexit, significant social changes (very evident from last week’s referendum). While the initial years of the recession actually saw some narrowing of regional disparities as all regions took a hit, the recovery has been spatially uneven and it could be argued that some of the trends driving the recovery e.g. multinational IT services firms, is accentuating regional imbalance. 2018 has seen the launch of the new National Planning Framework and a new National Development Plan, with three Regional Economic and Spatial Strategies currently being devised. Therefore it seems an opportune time to reflect on what we had to say about balanced regional development a decade ago. 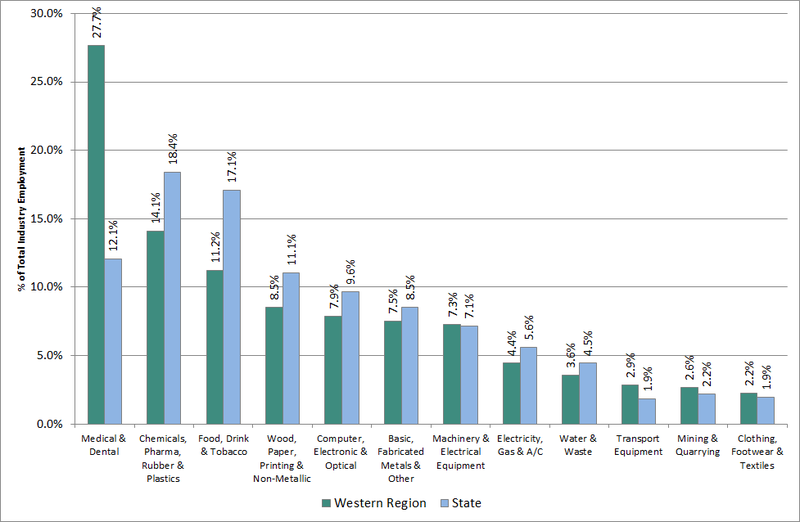 The WDC’s paper was titled ‘The Regional Development Challenge: A Western Region Perspective’ and it set out what we considered better regional balance might look like, i.e. what regional development policies should be trying to achieve. The list still seems as relevant today as then (but replacing the word ‘Gateway’ with city and key regional centres). 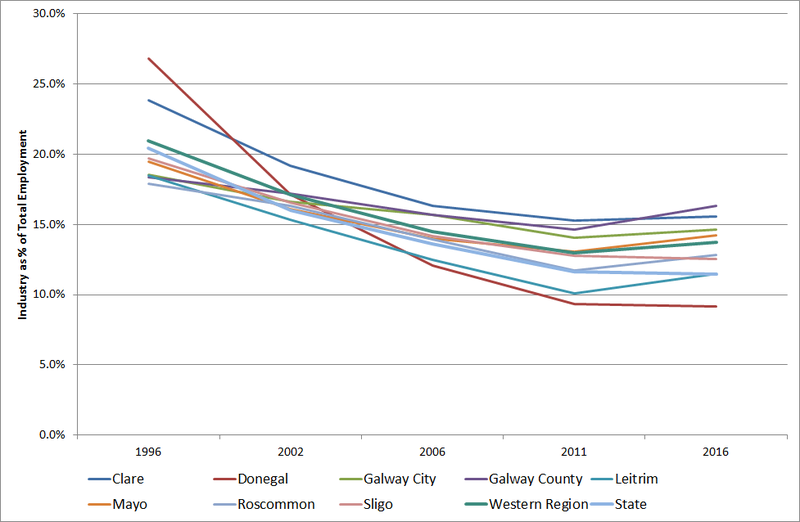 Future population growth distributed more evenly across Ireland. Gateway centres with sufficient critical mass to serve as drivers for their regions. Population increase in hubs and in small and medium-sized towns across the regions based on inward investment and indigenous economic activity, including significant employment in the public sector and locally traded services. The natural resources of rural areas utilised in a sustainable manner and such areas well-linked to local centres. An infrastructure base that enables all regions to optimise their participation in, and contribution to, the knowledge economy. Quality social provision at local level and efficient access to services in other centres so that location does not contribute to social exclusion. Careful planning and management of the environment, including landscape, cultural and heritage resources. Political commitment and vision based on an understanding of the kind of spatial structure most suited to Ireland’s social values, history and geography. Clear responsibility for delivery of regional development policy so that key government departments ‘mainstream’ the regional dimension into their spending decisions. One government department should have the mandate and resources for this and ensure, for instance, that other relevant departments include regional development outputs in their Annual Output statements to the Oireachtas. Resources should be provided to address the research and intelligence gap for policy-making, especially the development of regional indicators, measures of output and urban-rural links. Robust analyses of policy successes and failures are also necessary. Regional investment strategies should be directed to improving regions’ infrastructure, skill endowment and quality of life as the key drivers of their capacity to maximise their resource endowment and attract inward investment. Spending decisions in transport, energy, telecommunications, human resources, research, development and knowledge issues should clearly target reducing structural disparities between regions and not reinforce them. The NSS provides a robust framework for balanced regional development, but its operationalisation needs to be informed by a thorough understanding of the investment and planning requirements at different spatial levels. The new, smaller gateways need support appropriate to their scale and state of development that maximises the possibility of sustainable growth and encourages them to form strategic alliances. The interaction between gateways, hubs, provincial towns and rural areas needs to be investigated and understood in order to construct effective policy to support their function in the spatial hierarchy. All levels of government and stakeholders should be involved with common purpose in structures that facilitate knowledge-sharing and efficiency. Pending other reform, ‘ad hoc coalitions’ of local authorities could be an effective way of tackling common problems and facilitating cross-boundary/border cooperation between towns and smaller centres. The north-west of Ireland has some particular weaknesses that could be addressed by acceleration of investment in infrastructure links which would facilitate crossborder links and act as a counterbalance to the Dublin-Belfast corridor. It can be argued that some progress has been made in a number of these areas with efforts to more closely align the National Development Plan investment priorities with the National Planning Framework. However many of these recommendations remain relevant, the need to integrate regional development far more closely in the investment decisions of the main spending Departments, the need to understand the interactions between different levels on the spatial hierarchy far better and to develop effective policy for cities, towns and rural areas and of course the continuing challenge for development in the north-west, which has been further exacerbated by Brexit. It seems that delivering on effective balanced regional development is still a work in progress.